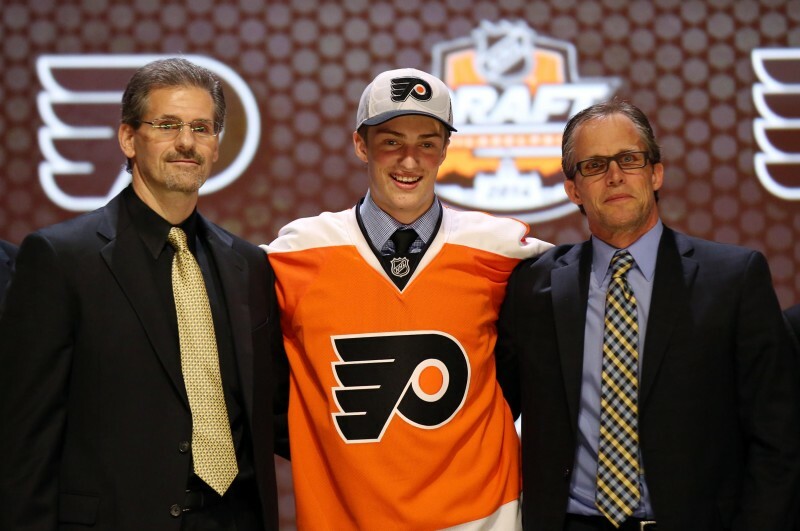 Last summer, the 2014 NHL draft was held in Philadelphia for the first time. The Flyers were coming off of a first round playoff exit and held the 17th selection. With a packed arena full of prospects, families, hockey royalty, and scouts, the Flyers faithful watched as the hometown team’s pick drew closer and closer. Before long, the pick was in. Who would it be? If the Flyers wanted to go offense, Kasperi Kapanen (Sami’s son) was there. If it was defense, local blueliner Anthony DeAngelo was still on the board as well. As new General Manager Ron Hextall made the selection, it was in fact a defender for the second year in a row, however, not the one most were expecting. Although not a reach by any means, Sanheim was not the name most were expecting to hear. Some even scrambled to their media guides to double check who exactly he was. Not Ron Hextall. The Flyers former fiery goaltender knew exactly who Sanheim was and admitted to targeting him at the 17th pick all along according to the Flyers draft board. The 6-3, 180 pound Sanheim had a reasonable rookie season with the Calgary Hitmen of the Western Hockey League (who selected him in the ninth round of the 2011 WHL Bantam draft) by posting five goals and 24 assists for 29 points in 67 games. It was his performance in the WJC for the Canadian U18 team that started turning heads. In seven games, he posted six assists with a plus-five rating and was named the best defenseman in the tournament. His effort helped to catapult him up the rankings to a point where he was considered a solid second round pick, if not a late first round pick by some. For a young kid who was rapidly improving, there was no telling just how high his ceiling could become. As rookie, development and Flyers training camp approached, most would get their first good look at Sanheim on the ice. Everyone had already seen 2013 picks Samuel Morin (how could you miss him?) and Robert Hagg. 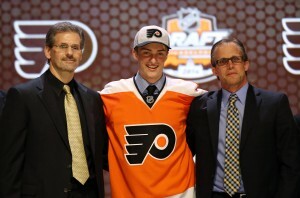 Same for 2012 pick Shayne Gostisbehere. Excitement was high for the future on defense. How would Sanheim fit in? Would he be worth the first round selection? As supporters and doubters would soon find out, the kid was for real. Looking anything but a rookie in development camp, he entered Flyers training camp and dressed for a few preseason games where he would get his first look against “NHL-level” talent. Amazingly, Sanheim was one of the better defensemen on the ice. He showed impressive vision and gave the Flyers brass a glimpse at his above-average puck moving skills while seemingly shutting down the opposition in his own zone. The Flyers challenged Sanheim to use the experience and continue to improve in Calgary as they sent him back to his junior squad, but not before wisely inking him to an entry-level contract. Sanheim returned to Calgary for his second season and assumed more of a leadership role with the Hitmen as he was named an alternate captain. Another interesting tidbit is that former Flyer Joel Otto is an assistant coach for Calgary, an obvious advantage for Sanheim and teammate Radel Fazleev who was also selected by the Flyers. With the Hitmen clicking on all cylinders, Sanheim turned in what can only be described as a phenomenal season in which he scored 15 goals, 50 assists and 65 points in 67 games with a plus-27 rating while establishing himself as one of, if not the best defensemen in the WHL. It was encouraging to see Sanheim seemingly get stronger after he was cut from the Canadian team participating in the 2015 WJC, which was not a reflection on Sanheim as much as it was a testament to how deep the defense is among Canadian prospects. To prove the season was not a fluke, Sanheim scored an additional 18 points in 17 playoff games before Calgary was eliminated by the Brandon Wheat Kings. Button’s declaration is a HUGE vote of confidence seeing as how Calder Trophy candidate and 2014 first overall pick Aaron Ekblad was also born in 1996 and turned in an eye-opening rooking season for the Florida Panthers while playing between 20 and 22 minutes per game. If Button’s assessment holds true, the Flyers could potentially be grooming one of the better defenders to wear orange and black in a list that includes Mark Howe, Eric Desjardins and Kimmo Timonen. Before the season started, Sanheim was at the bottom of the depth chart among the ‘Core Four’ of defensive prospects which also includes Gostisbehere, Morin and Hagg. Morin almost made the club out of training camp and will either make it this season or play for the Lehigh Valley Phantoms in the AHL. Gostisbehere started the year in Lehigh Valley and was quickly recalled to the big club due to injuries. After getting his feet wet in two games, he was sent back down and suffered a season-ending injury. Hagg was serviceable in the AHL as he adjused to a full season of North American hockey where the rinks are smaller and there are more games played. While Sanheim is not expected to play for the Flyers or the Phantoms this upcoming season, he very likely has re-ignited the conversation as to where he fits in among the others. For my money, he has made the leap to the beginning of the pack. CSNPhilly’s Tim Riday had a similar sentiment as he recently ranked the defensive prospects and listed Sanheim at the top of this list. Our very own David Quackenbos shared the idea during his series in which he counted down the Flyers best prospects, with the finale listing Sanheim as first overall. Not only do I think Sanheim should be in the discussion as top defensive prospect, I also think he should be in the discussion as the Flyers top overall prospect. As his ceiling continues to grow, the organization continues to be excited about the player he is shaping up to become. Like most top prospects, Sanheim knows exactly what he has to do. Sanheim will benefit under the tutelage of first-year Flyers coach Dave Hakstol who spent the last 11 years developing future NHL stars such as Jonathan Toews and T.J. Oshie at the University of North Dakota. If he continues to absorb everything the Flyers and Hakstol will throw at him, he will likely make his third season in Calgary better than his last. While we can’t reserve a spot in the Flyers Hall of Fame for him just yet, we can certainly rest assured that he is a prospect with obvious NHL talent. Even with Ekblad’s breakout season in Florida, Sanheim may very well be the gem of the 2014 NHL Draft. Once he makes the jump along with the rest of the ‘Core Four’, the Flyers defensive woes will be a thing of the past.